Out on the peaceful pristine waters of Southeast Alaska, we invite you to a world of whale watching dreaminess. 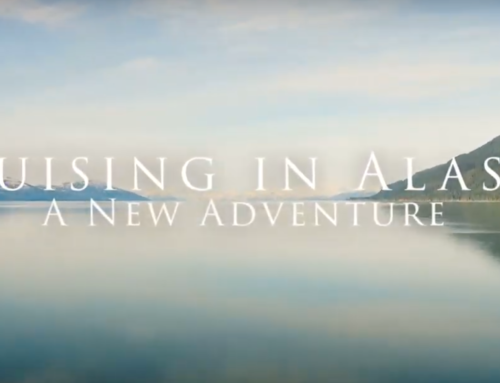 Hoping you’re a wilderness seeker in pursuit of natural beauty, Juneau is endowed with copious wildlife: more animals than people in fact. 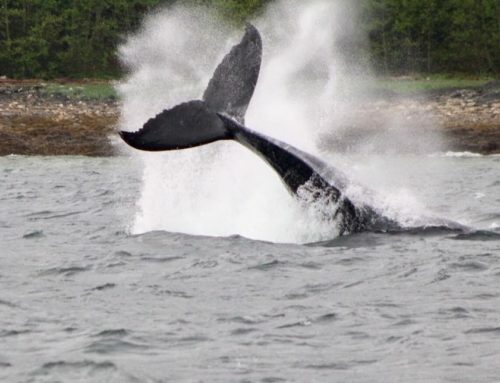 Many of these natural wonders abound in our sparkling waters: foremost the humpback whales, who, when they’re feeling playful, may roll over, fin-slap, tail-lob or even spy-hop (poking their head out of the water to survey their surroundings) to our customer’s delight. Even en route to the whales, you may well see the humpbacks! What Should I Expect On A Typical Whale Watching Tour? We can’t wait for you to see the whales cut gently through the water, spurting huge puffs from their blowholes as they go. The staff on board sometimes deploy a hydrophone in the water when the whales are present. This is an underwater microphone so you get to incline your head on their communications. To eavesdrop on the whales warbling their haunting, unearthly songs. There’s nothing quite like listening to a baffling concert of cries, moans, squeaks, clicks and whistles at sea. Although no underwater microphones are needed to hear the whales’ excited tonal blows—occurring repeatedly—loudly reverberating off the water with every trumpeting exhalation! You’ll observe how unperturbed the whales are by your peripheral presence. Juneau Tours and Whale Watch is member of Whale Sense, so our boats remain at a respectful distance to the marine mammals (meet the fleet). Where proximity to them increases–within permitted distances–the captains will switch the engines off. That said, with the motor killed, the whales care little and less about us watching intently. They’re too busy feeding their faces with fish by the bucket-load. How to dress on a drizzly day in Juneau. Needless to say, we take the creation of a calm atmosphere around the whales very seriously. One that promotes an eco-centric culture where there are whales. Namely, maintaining a peripheral presence, leaving the whales unperturbed and let’s be honest, free to feed their faces on the gourmet offerings of Juneau’s waters. It’s for that reason we can assure you that the attendance of our boats is neither encroaching nor impinging, upon such an important time for the whales. So, come get your whale on, we want to leave you wide-eyed on whales! The whales are such a fine example of Mother Nature’s uninhibited. Will I Only See Whales? Heck, no! Aside from the whales, our guests often get to glimpse the curious harbor seals at the marina. As well, watch the sea lions basking in the sun and porpoises cruising through the water. Salmon, herring and other fish are forever flipping out of the water. It’s a sublime watery wilderness all below a sky’s worth of eagles. If you’ve got eyes, you’ll encounter the glory of Juneau’s bald eagles soaring overhead and gliding in, trimming their angles this way and that. Honestly, they’re like crows up here. The savvy two-winged assailants can spot a fish from up to a mile away, and think nothing of nose-diving at 100mph when they’ve caught one in their sight. In fact, Juneau boasts one of North America’s highest concentration of the white-headed baldies, so don’t forget to look up. 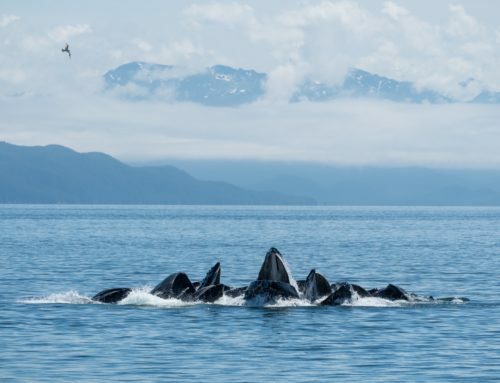 A Whale Of A Tale: Why Does Juneau Have So Many Humpback Whales? 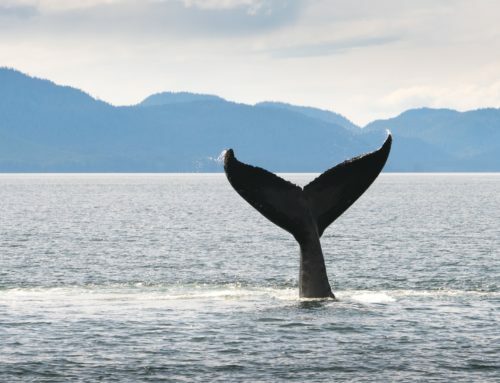 Because in the region of 5% of Southeast Alaska’s humpback whale population embark upon an annual odyssey to nourish themselves after a 3,000 mile migration. 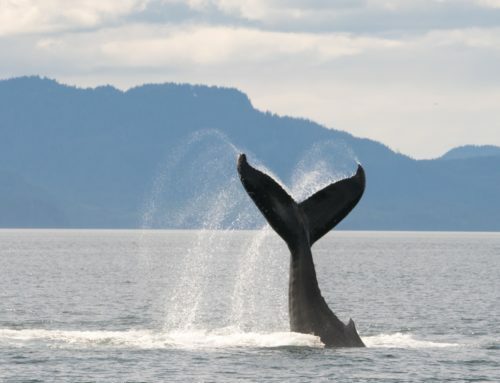 Courtesy of Juneau’s nutrient rich waters, which are teeming with herring and other baitfish, krill and plankton, the whales feast to their belly’s desire. And regularly, just like we do. But for the whales, it’s feeding time all day! 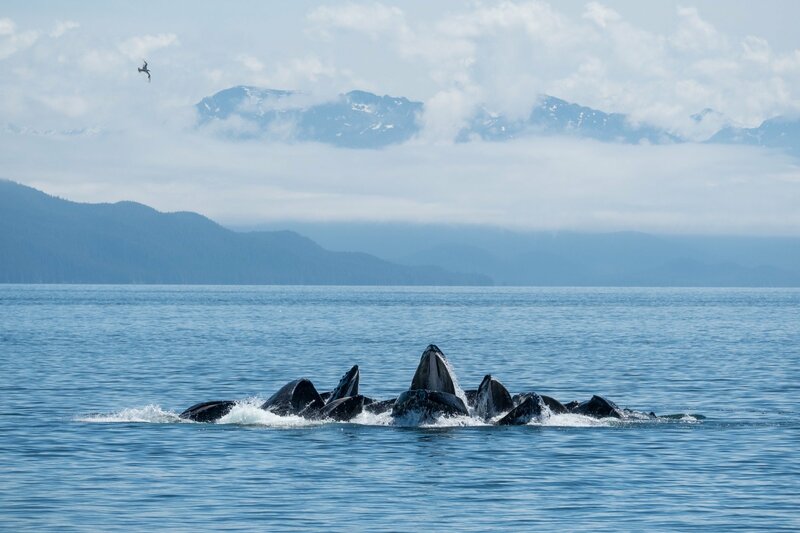 Although there may be more, as far as numbers go: 150 humpback whales have been officially documented, which abound in Juneau’s protected waters! And, because the Inside Passage of the Alaskan Marine Highway is a relatively narrow body of water, makes the whales easy to spot. It is estimated that the worldwide population is at least 80,000, with 18,000–20,000 in the North Pacific, about 12,000 in the North Atlantic and over 50,000 in the Southern Hemisphere, down from a prewhaling population of 125,000. Humpback whales are migratory animals, traveling up to 3,000 miles from their feeding grounds in the cold waters of the Polar Regions, to their breeding grounds in the warmer waters of tropical regions. Often, in as little as 36 days! (Read more from NOAA, the National Oceanic and Atmospheric Administration.) Specifically, the winter season sees the whales in North Pacific Ocean to Hawaii, Central America, Asia and Mexico. This is where the humpbacks propel the circle of life and nurse their young. Many then come to fill their bellies in the nutrient-rich waters of Alaska, Eastern Russia and British Columbia in the summer months. Feasting like kings on krill (small shrimp-like crustaceans), herring, other small baitfish, an adult humpback averages at 42 feet long (12.8 meters) and around 25 tons. Although we kid you not when we know they can reach up to 60 feet and 40 tons! Are There Orcas In Juneau’s Waters? Yes there are! Commonly known as killer whales, orcas aren’t really whales at all: they’re a species of dolphin. But playful like Flipper the friendly dolphin they’re not. Orcas rank among the blue planet’s most adept predators; their true hunting spirit known to take out semi-submerged moose, whales, and even great white sharks! Fortune for them, they have no natural predators. Although in Juneau, our monochromatic friends love to dine on the local salmon, who wouldn’t? A lot more elusive than the humpbacks, the nomadic killer whales travel up to 100 miles in a day. Nonetheless, they are very distinctive with black and white markings, making them easy to spot. A male’s dorsal fin for example can reach lofty heights of up to six foot. What’s more, the males get up to 32 feet long and 11 tons (find out more at NOAA). It’s no surprise that the local Natives revere such marvels of the ocean, depicting them heavily in Southeast Alaskan culture. And best of all, Juneau enjoys both resident pods and transient pods, which hoping you get lucky, you might just get to see the black magic carving through the water. Sometimes the whales swim right up to us when we are drifting, with the motor off. We invite you to immerse yourself in our eye-popping whale tours. Juneau is where they’re at; a place beyond thoughts. We hope you experience it for yourself, we really do. In the meantime, see our guest’s Facebook photos and videos: they’re awesome. This humpback is brimming with excitement as he breaches!